Anyone wanting a thorough understanding of the key factors that account for the style, quality and price of primary still, sparkling and fortified wines of the world. Professionals in retail and hospitality industries looking for the knowledge to advise management, make informed selections of wines and answer customer questions authoritatively. Wine enthusiasts and collectors searching for more in-depth understanding on wines of the world including assessing quality and price. WSET Level 2 Award in Wines & Spirits or equivalent experience is strongly recommended. If you have any questions please contact Spirited Grape. Successful candidates receive the WSET Level 3 Award in Wines certificate and lapel pin. Now two ways to learn - Classroom or Online! Don't see a schedule that works? Check back often, new classes scheduled all the time. Tuition includes all registration fees, study kit, classroom instruction, exam and wines tasted in class. Select "Enroll Now" to pay by Visa, MasterCard or American Express. Please contact Spirited Grape at 401-632-0149 for alternative payment methods. Learn about wines and spirits through our 9-week interactive online study program that is flexible to work around your busy schedule. 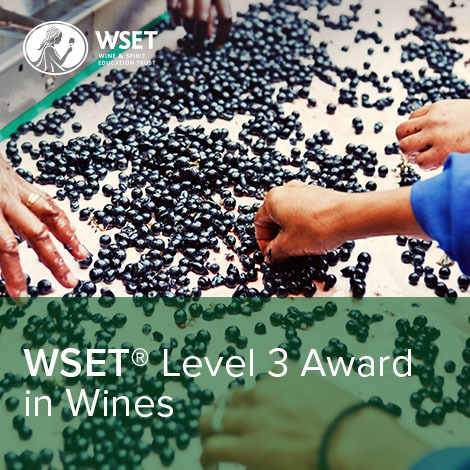 The WSET Level 3 Award in Wines Online course covers the same syllabus as our classroom course, but through a supported and interactive online classroom which allows you to study alongside your peers under the guidance of a dedicated educator. This is a nine-week, instructor let online course with fixed start and end dates with a recommendation of 10 hours of study per week to cover the online activities and read the relevant chapters in the textbook. There is also a 1 day tasting tutorial. The course follows a weekly structure, but it allows the student to work ahead or catch up on activities and forums. There are no set times to log into the course as there are no live chats or webinars. Each week consists of a series of online activities, often based on group discussion, with an online tutor allocated to guide you in your studies. A timed feedback test is provided at the end of each week for you to practice for the exam and assess your understanding of that week’s topics. Group tasting activities are also provided to familiarize you with the Systematic Approach to Tasting at the beginner level. WSET Level 3 Wine exam - 50 multiple choice questions, a paper of short written answers, and a blind tasting of two wines. Exams must be taken in person at our Providence RI location. Tuition includes all registration fees, study kit, guided online instruction and exam. Select "Enroll Now" to pay by Visa, MasterCard or American Express. Please contact Spirited Grape at 401-632-0149 for alternative payment methods.